The poster. (IMDb helped.) Emile and Paul making their way. I had done my duty to the fine young pair who showed up for Thursday’s SuperCool Chance to Play Basketball On the Freshly Varnished Hardwood Before School Even Starts! (Little O and Uncle Drew did great.) I had even been a good little writer afterward, though I confess that I cheated the typing gods by shortening the time. (Still, though, my thinking was interesting – take it from me – and I may have found a way out of a large, thorny maze where my book got lost.) Cezanne et Moi seemed tailor-made as a writer’s treat and re-treat, and it was the last screening at my cinema of choice. So yeah, I rewarded myself with a luscious dessert when I hadn’t actually finished my first course, but the guilt faded fast. I’m glad I went. 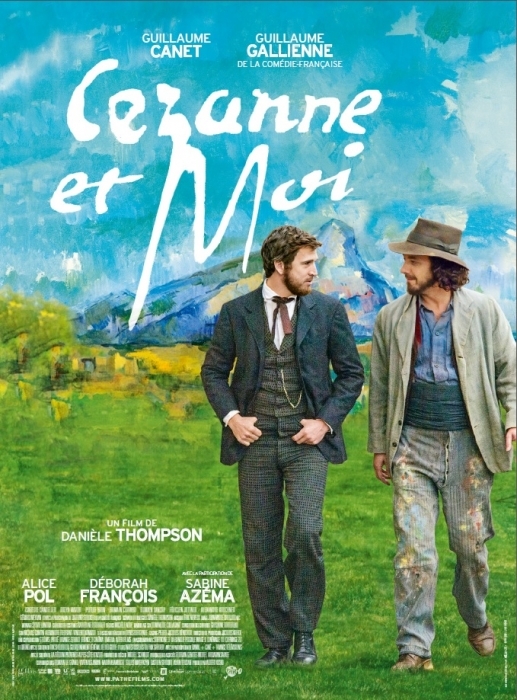 Irrational confidence alert: through BioPic Magic, I feel that I now understood 19th-century painter Paul Cezanne without much effort, and intimately know his lifelong friend and sometime antagonist, the writer Emile Zola, without having read a single novel of his. (But that’s what Wikipedia is for, right? Um, right?) I am hungry to know these two artists better, though, and was exposed to a nearly two-hour, loving meditation on friendship, love, and on the meaning and practice of the creative life. WIN. I’d gladly watch it again. When you look up “old frenemies” in the dictionary. It’s a gorgeous film to look at.